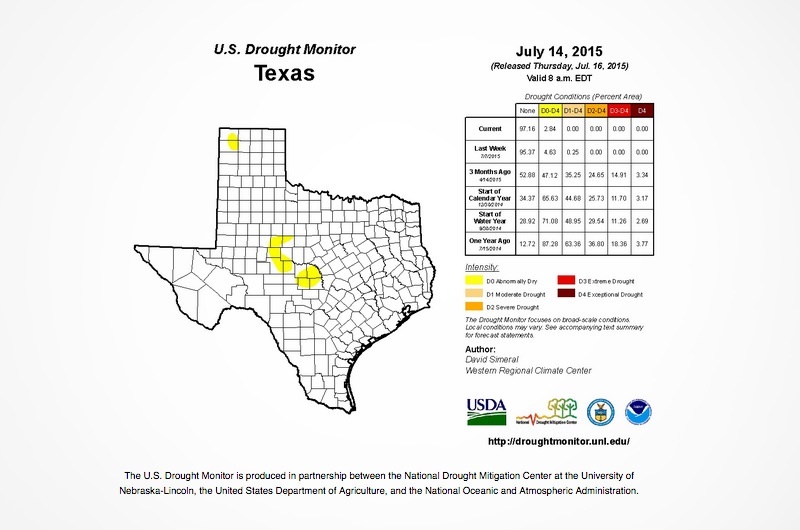 For the first time in more than five years, Texas is not in a drought. While less than 3 percent of the state remains “abnormally dry,” according to the latest U.S. Drought Monitor report, drought has disappeared from every other part of Texas. Just three months ago, more than 35 percent of the Lone Star State was in some form of drought — either moderate, severe, extreme or exceptional, depending on the location. A year ago, it was more than 60 percent. Texas has been in varying degrees of drought since April 2010, according to the Texas Water Development Board. Those reservoirs serve as drinking water supplies for many small cities.